My friend Chris called me last Friday and said in a tiny voice "Lorry--my baby girl died yesterday." Her baby girl was Julie who was 33 and a single parent who fought a valiant fight for 21 months against invasive brain cancer. She had her affairs in order and her sister Sherry has custody of her children now. Kristoper is 12 and Karlee is 7. I want to make them comfortghans to show them that people care about their loss and what they have gone through living with their Momma who was dying. Kristoper likes Orange, yellow and red. Karlee likes pinks, purple and white. 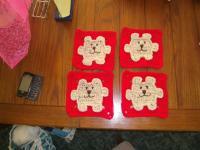 I would like 7" squares and maybe a card or bit of encouragement to give them. This has just left me so sad. My heart is heavy. I was thinking what can I do to help these kids? And thought--the Crochetville family will help me out! I haven't had to deal with children this young who have lost a parent. God bless those babies! I will work on squares to send right away. My own sons' father passed away 6 years ago in June. I will make squares, too. How very sad, so sorry for them. How soon do you need the squares? What yarn 4 ply, a particular brand? I'll get some made too but it will be a few weeks before I can send them. What type of yarn? Good old worsted weight. I use Red Heart and Bernat a lot. Thanks for all the help, ladies! This has really been hard for us to deal with. I can't even imagine. Likewise it will take me a couple weeks to get some made but I will do my best. I am so sorry to hear about your friend's loss of her daughter. I will try too get some squares made as soon as I can. My son died at 25, leaving behind a sweet young daughter. 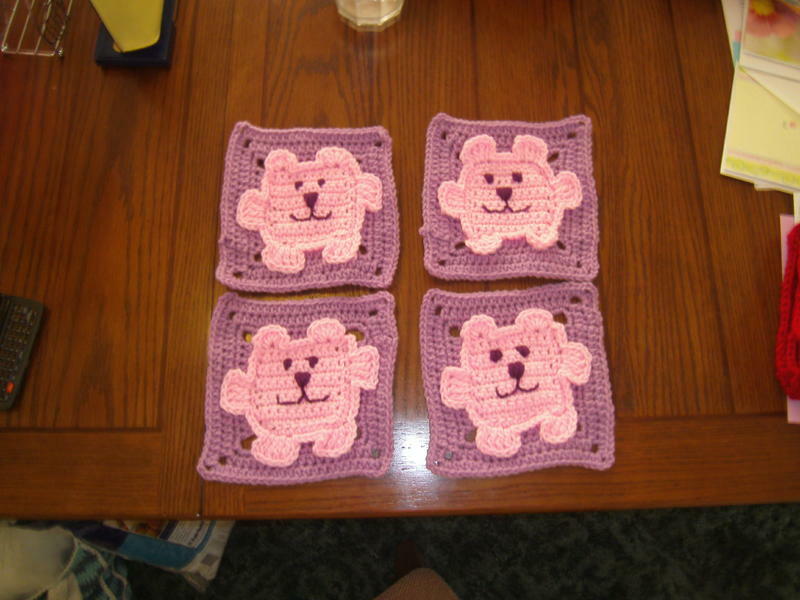 I will make you at least two squares for the children. I'll send you a couple of each. I'm working on a couple of squares for you. Please PM me with your address, I hope to have them in the mail early next week. I have these ten squares ready; if you can use them pm me your address and I'll try to get them into the mail on Monday. I have 8 squares ready to send, I just need your address. I thought I sent you a PM, but maybe your inbox is full. I have two squares ready if you'll pm me your address. 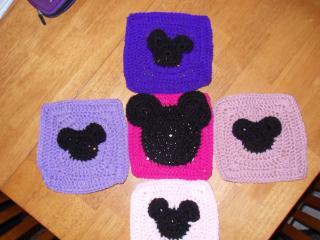 I have some squares ready too but need an address to mail them to. I'll send you a PM also. Thank you. I had been wanting to try this square forever... So I finally got that out of my system. 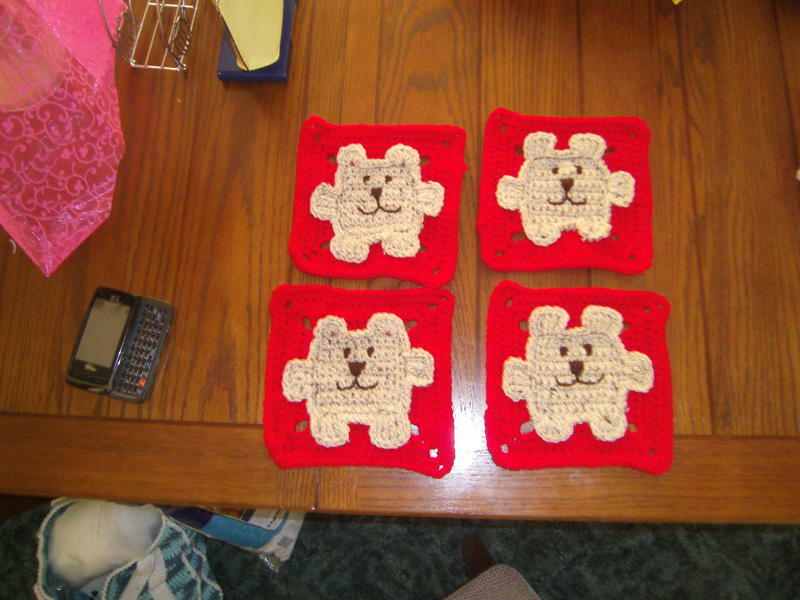 They are super cute, I hope to make more of these but 8" wide for a charity I am in. I mailed the squares out today, Lorry. Tina I got your squares today! So cute! I have been in such a funk. I haven't even started their squares yet. I am working on a wedding afghan (wedding was last week!) and have a graduation afghan to finish. I haven't been much good doing anything lately! 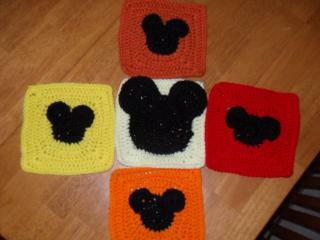 The Mickey mouse squares are so cute! They did get to go to Disney world with their mom when her cancer was in remission. That is so awesome their squares have the "Mouse" on them, too! I talked to Chris yesterday and they had to have Julie's cat put to sleep. She had had her since she was a teenager and the cat had been in failing health. I say she went to be with her Momma. Life goes on! Thanks every one! Your squares went into the mail yesterday. Thinking of all of you. Everyone's squares look so nice!! Carol and Peggy I did get your packages and everything is so beautiful. These kids are gonna love their afghans. I am aiming towards fall to finish them. 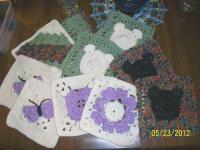 Lots to crochet here--weddings and babies and graduations! I am an afghan gift giver and now it is expected!